The Stones of Mora (Swedish: Mora stenar) is a historic location in Knivsta where Swedish kings were elected until 1457. The origin of the tradition is unknown. The name "Stones of Mora", Mora stenar in Swedish, was originally in singular, Mora sten "Stone of Mora", and referred to a "king stone" on which the newly elected king stood after the election. Later monuments in stone around the Stone of Mora, commemorating different elections, changed the name to the plural form. Another name often used referring to the place where the king was elected was Mora äng, "Meadow of Mora". In Lagga parish about 10 km south-east of Uppsala, but (since 2003) in neighbouring Knivsta Municipality, is Mora äng (Mora Meadow). The location is at equal distance from the Things of the old folklands Attundaland and Tiundaland. This was the location of Mora Thing (called Múlaþing by Snorri Sturluson, see Þorgnýr the Lawspeaker), where the Swedish kings were elected. After his election was decided, the king was elevated on top of a flat stone and hailed by his subjects. Woodcut showing election of the king. The law of Uppland and Södermanland states: The three folklands, that is Tiundaland, Attundaland and Fjärdhundraland, shall first elect king. Then the election will be sanctioned by the lawspeaker of Uppland and then by all his subordinate lawspeakers in the rest of the kingdom, one by one. This process was done during the Eriksgata. The Westrogothic law reminded the Geats that they had to accept this election: Sveær egho konung at taka ok sva vrækæ meaning Swedes have the right of choosing and deposing the king. The detail that the Swedes were not only entitled to elect their king, but that they also had the right to depose him was institutionalized a long time before, as attested by Snorri Sturlason's (died 1241) accounts of Swedish history (the speech of Þorgnýr the Lawspeaker, and the deaths of Domalde and Egil son of Aun son of Jörund in the Heimskringla). The location was on the border of a wetland, and according to Snorri, five kings had been drowned in this wetland, when the people had been displeased. The newly elected king also had to go around Sweden on the Eriksgata, including the Geatish provinces. It was thus a sort of federation where the king started with his election at Mora Thing and then travelled throughout the kingdom to have the election confirmed by the local assemblies. 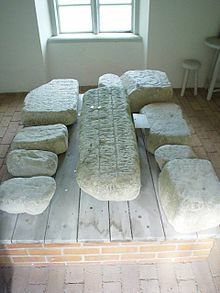 The Stone of Mora and many stones which flanked it with inscriptions commemorating the elections of earlier kings, were probably destroyed in 1515 during the civil war against the Danes. Gustav Vasa and John III are said to have tried to reconstruct the Stones of Mora without success. One of the fragments is known as the Three Crowns stone since it is the earliest known example of the use of Sweden's national symbol, the Three Crowns. The fragment is what remains of the stone for the election of Albert of Mecklenburg. Magnus Ladulås. There is a document which tells that he was elected at the Stones of Mora in 1275. Magnus Eriksson was elected at the stones on July 8, 1319. Kristian I, in 1457, he was the last to be elected at the stones. The building where the fragments are contained was constructed by Carl Wijnbladh in 1770. In 2002, in anticipation of Knivsta (part of the Uppsala Municipality since 1971) regaining its status of a municipality of its own in 2003, the Swedish state herald designed and registered a coat of arms for Knivsta based on the stone of Mora motif: an open crown over a heraldic trimount. The design was based on a sketch by a schoolchild, one of many emerging from a local contest. Wikimedia Commons has media related to Mora stenar.